It is well-known that the mirror of the traditional Hasselblad cameras is too short to see all the image with the lenses over 150 mm (all is OK with a 150 mm). Since the 2000 series and the 500 ELX the mirror have been lengthen and comes with a gliding system to avoid to strike the rear part of the lens while raising. Therefore, no vignetting occurs in the viewer of these cameras and the following of the 2000 and 200 series and the 553/555 ELX. The 503 CW have been designed with a similar device, the GMS (gliding mirror system) and the new 501 CM too. Thus suffer from the problem the : 500 C, 500 CM, 503 CX, 503 CXI, 501 C, 500 EL, 500 ELM. 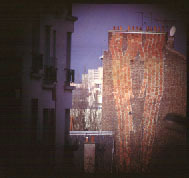 This cut-off relates only to the viewing; on the film, photographs don't keep any sign. All the following photographs show the screen of a 503 CX. I gathered CF and F lenses for this review. 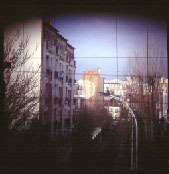 The cut-off may vary slightly for a given focal due to maximum opening and/or design (the path of the light could vary much more in short lenses). Thus these pictures might not be absolutely representative of what one could see with a CF lens, except for the 180 mm. 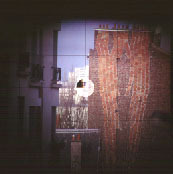 The screen is shot directly, as the waist-level folding viewer would have cut the borders. Unfortunately the shadows are over-darkened. No trouble using a 150 mm, all is OK. But with the 180 mm what an approximate framing ! By the way, I'm astonished that the cut-off is stronger on the 180 CF than with the 250 F, which is also an f 4. From 350 mm and up, vignetting doesn't grow much. With the GMS mirror on the 201 F one sees all the image. what happens at close-up ? 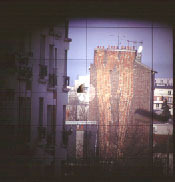 That picture has been shot the same way as upper telephoto screens. 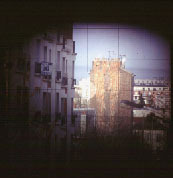 The distance from lens to screen is really too much, and picture is over-vignetted. 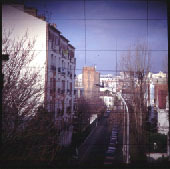 In the viewer, cut-off comes approximately to the yellow line. 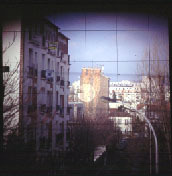 Of course the photographs taken with any of the Hasselblad cameras don't wear any sign of the cut-off in the viewer.